En la Edad Media, la ciudad se rodea de la muralla. 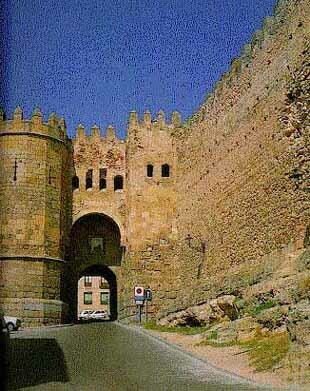 En el S.XI, Alfonso VI de Castilla, toma definitivamente Segovia a los árabes y la completa utilizando a los propios alarifes (operarios de construcción) sometidos, llegando a tener la muralla un perímetro de 3 Km. Originalmente estuvo coronada por 80 torres 7 puertas y 5 portillos. En la fotografía inferior se aprecia la Puerta de San Andrés, también llamada Del Socorro dedicada a esta virgen alojada en un camarín del mismo. Se sitúa sobre el valle del río Clamores y da paso a la antigua Judería. Fue restaurada por Carlos I (S.XVI) y una lápida recuerda en ella las andanzas del Buscón Don Pablo. 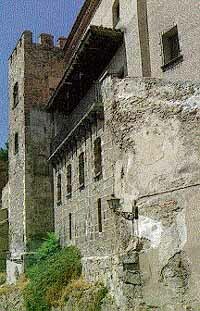 During the Middle Ages, the city was surrounded by walls. But it is not until the conquest of the city by King Alfons VI of Castille from the Muslims, who in the 11th cent. finishes the city walls putting to work the conquered alarifes (construction workers) by which the walls reach a perimeter of 3 Km. Originally, it was crowned by 80 towers, 7 gates and 5 small doors. The lower picture portrays the Gate of Saint Andrews, also called the Gate of the Succor dedicated to that Virgin housed in its chamber. It is situated over the Valley of the Clamores River and gives entrance to the old Jewish quarter, underwent restoration during the reign of Charles I, in the 16th cent., and one tombstone reminds us of the adventures of the Buscon Don Pablos.